Yesterday afternoon the City Council got an update from the City Budget Office on projected revenues and expenses. They weren’t sounding an alarm — yet — but the numbers suggest there is cause for concern about 2019 and beyond. The city budget office does a lot of work to forecast city tax revenues for the next few years. Among the many economic indicators they track, two stand out. The first is building permits, a leading indicator of construction activity, employment, and commerce related to construction. In the third quarter of 2017 there was a big spike in permits issued, which the city attributes to developers trying to get their permits before a number of land use and building code changes took effect. 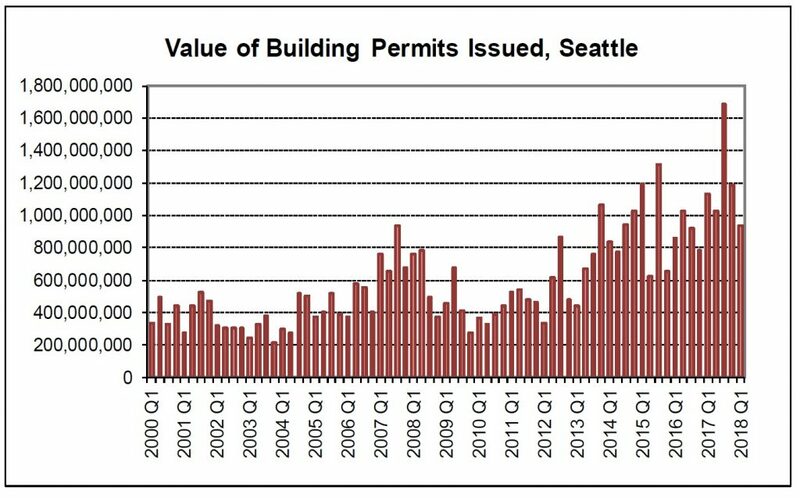 You can see in the graph below that in the fourth quarter of 2017 and the first quarter of 2018 the number of permits issued dropped back down. 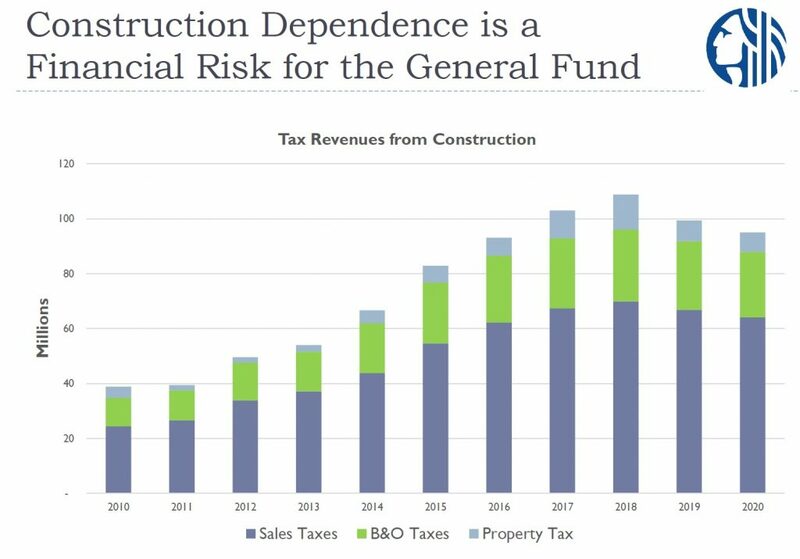 Construction currently has an outsized effect on the city’s revenues; it feeds B&O taxes, sales taxes for construction materials, property taxes, and utility taxes. This will be a recurring theme as we dive into what’s currently happening with city finances. 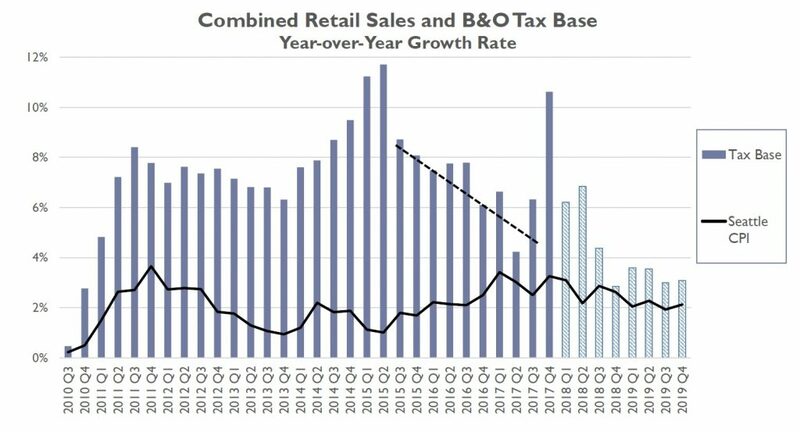 But you can see below that in the fourth quarter of 2017, immediately after the spike in permits, there was a spike in retail sales and B&O taxes — bucking an overall slowing in revenue growth. The other economic indicator that the city watches closely is employment. Employment growth has peaked at about 3% annually for the past few years, and is now also predicted to slow. In the short term this is being driven locally by layoffs at Boeing, construction cooling off, and slower hiring at Microsoft and Amazon. But economists are also expecting the national economy to start cooling off in 2020, ending the second-longest post-WWII economic expansion period. For sales and B&O taxes, this means much lower rates of growth — around 3% in the latter part of 2018 and into 2019. That’s still above the local Consumer Price Index (CPI) estimate of inflation, but not by much. 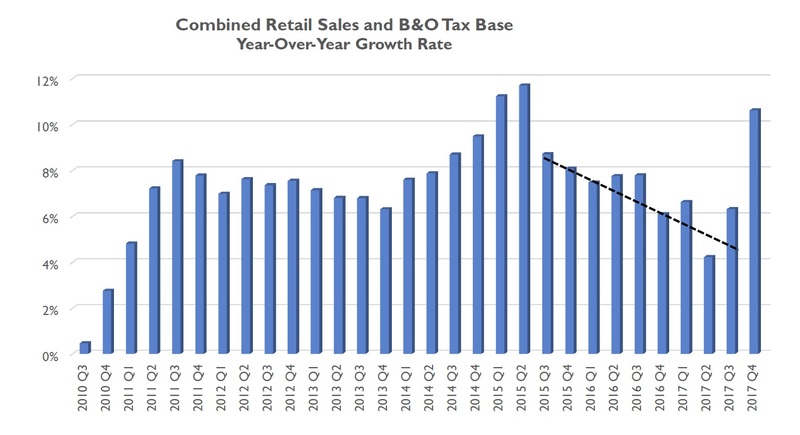 This is actually a bigger problem than it seems at first glance, because sales and B&O taxes are only about 43% of the city’s General Fund revenues. Property taxes are another 22%, but their growth is capped by state law at a rate that is consistently under the CPI. So in order for revenues to keep up with inflation, sales and business taxes need to exceed the CPI by enough to compensate for lower growth in property tax revenues. Here’s the city’s projections for general fund revenues through 2020. Property taxes are predicted to increase 5.4% this year, 2.4% in 2019, and 10.8% in 2020 — that’s a big swing. 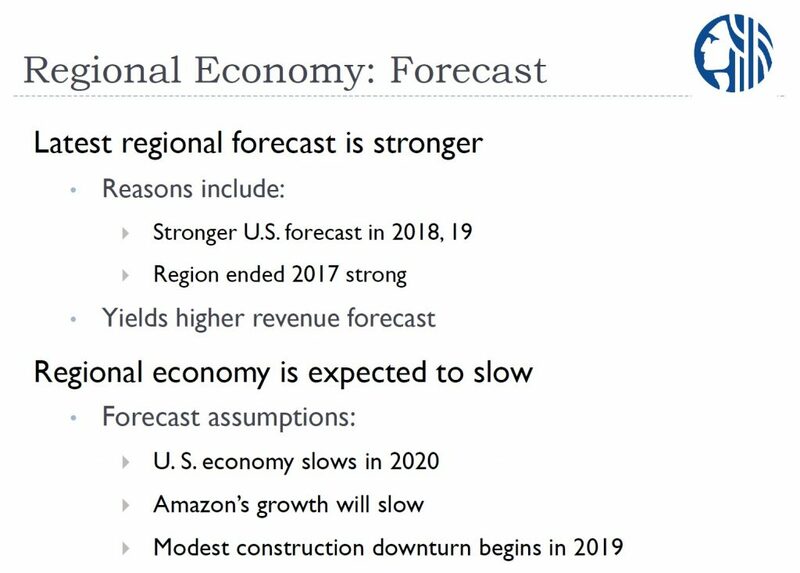 Overall, total revenues are expected to increase 4.8% this year, 2.6% in 2019 and 4.9% in 2020. But the flip side is that expenses have also been rising dramatically. You can see in the table below the predictions for expenditures, assuming the current baseline budget and incorporating known wage increases and expected other cost increases. The “reserves” line is a set-aside for collective-bargaining contracts that are coming up for renewal where the city expects that it will need to negotiate higher wages. The city has also spent a fair amount of time looking into the “judgment and claims” fund after recent cost overruns, and believes that it will need to set aside $30 million to settle known claims against the city that it will need to pay out over the next three years. Together, that makes expenses slightly higher than revenues — a continuation of a trend for the past few years. That’s been okay up until now because in practice the city has tended to underspend its allocated budget, and it had accumulated a positive balance in the General Fund. But that balance is almost exhausted; this is the last year that deficit spending won’t result in a negative fund balance at the end of the year. The city is spending beyond its means, and that is no longer sustainable. The trick to cutting the budget, however, is that cuts need to be sustained; cutting one-time expenses just kicks the can down the road. The cuts also need to come from the big departments: police, fire, transportation, parks, and human services. If the big departments don’t make cuts, the dozens of smaller departments can’t possibly compensate to bring down the deficit. (Seattle City Light and Seattle Public Utilities have their own revenue and expense models separate from the General Fund). The departmental cuts will be an uncomfortable process, but a manageable one. The scarier prospect is how dependent the city revenues are on construction activity. This year, general fund tax revenues from construction are expected to total almost $110 million. But construction is a cyclical business (flip back and look at the construction permits chart again). It can also drop off a cliff with little notice, as the last two recessions have proven. If it does that again, there will be a deep shock to the city budget. 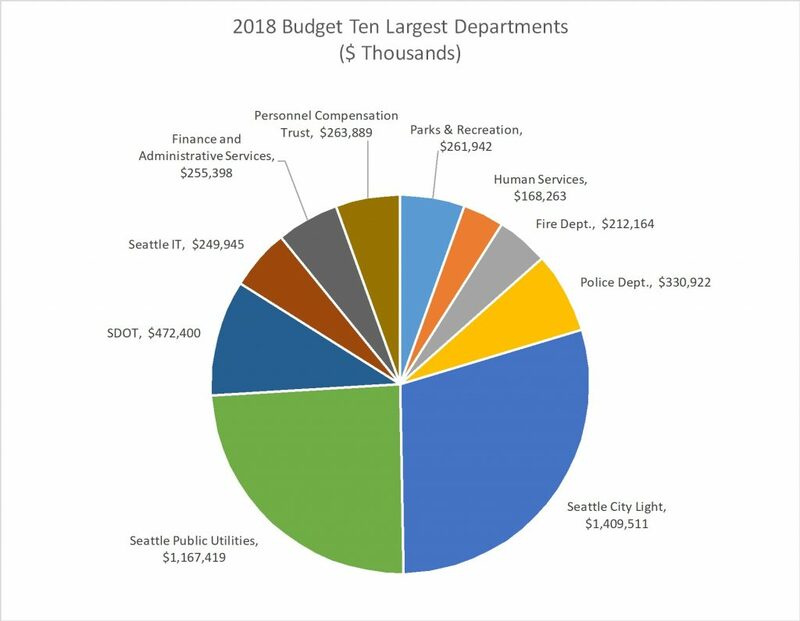 Seattle does have a “rainy day fund” set aside to offset dramatic revenue shortfalls, which currently contains about $54 million. That would buy a year, perhaps two, to rework the city budget if the bottom fell out of the construction industry in Seattle. The proposed new employee-hours/payroll tax would provide funds for additional spending on homelessness, but all the new revenues are already spoken for, so it won’t help cover the existing deficit — or sustaining any of the programs funded with one-time sources (like selling property) in this year’s budget. While we’re briefly on the subject of the new tax on businesses, here’s an interesting tidbit from yesterday’s presentation: the share of general fund revenues currently paid by businesses. In total, it’s around 57%. If $75 million of new taxes are added, that figure will rise to about 60%. This is the last year it can continue its pattern of slight deficit spending, because the fund balance is exhausted. Economic growth in Seattle is slowing, which will hold down revenue growth even as expenses continue to climb. 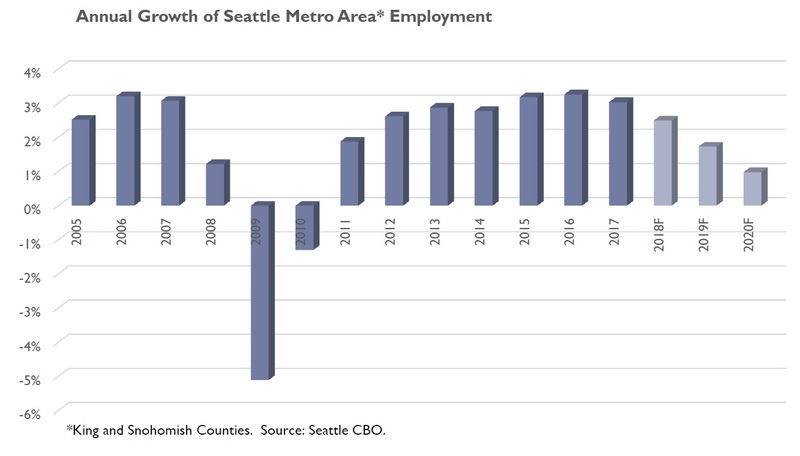 Seattle’s economy, and the city government budget, have become dependent on the cyclical construction industry, and when that time bomb goes off it will be painful. The best we can hope for is a gradual decrease in construction activity. There are some tools in place to manage the short-term effects of slower growth. Mayor Durkan is moving proactively to curb growth in city spending. 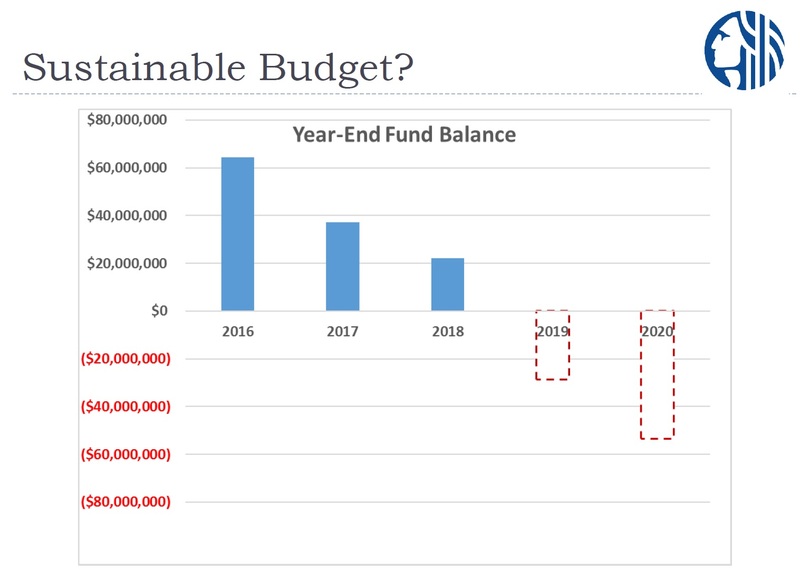 The City Council needs to discover the virtues of fiscal discipline in time for next fall’s 2019-2020 budget development process. You can watch the full briefing on the Seattle Channel. Thanks for another excellent analysis, You have a remarkable ability to explain exactly what is happening. It will be interesting to see what develops. This is excellent and much needed analysis of our City budget situation. Thank you. If 2017’s budget fiasco is any indication of what’s to come this year — when the revenue outlook is bleaker and political divisions are sharper — buckle up! 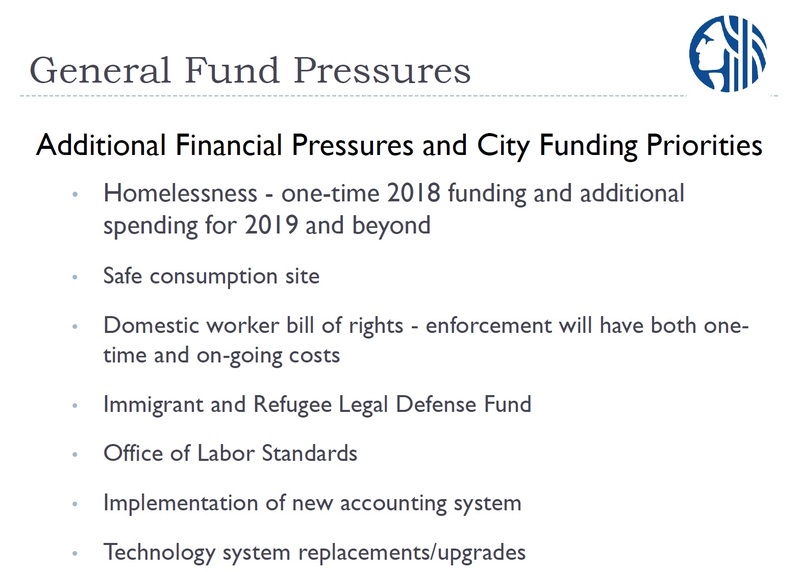 The City Budget Office deserves most of the credit for the analysis — their presentation to the Council asked and answered the hard questions. I just tried my best to translate it into English and highlight the most salient points. Newbie here. Why does Seattle city light use more than 25 percent of budget? What does it spend money on? It’s a billion-dollar utility company. Employee wages and benefits, equipment, vehicle fleet, IT, etc. It’s easier just to think of it as a separate subsidiary of the city and factor it out of budget discussions. Same for SPU.